Have you planted hardy mums that never came back the next year? You’re not alone; most fall mums are “throwaways”, but it is possible to permanently add mums to your perennial garden. One secret to success is to buy them early and plant them right away. The sooner you plant mums the happier they’ll be. Mums that are trapped in a small pot for too long, or allowed to dry out, will be too exhausted to grow new roots once they are planted. Smart shoppers look for mums with lots of unopened buds, for the longest lasting bloom. Pedigree is very important with mums. Mum breeders select for flower color, length of flowering, sturdiness, resistance to disease, and an attractive compact mounding shape. Like thoroughbred horses and AKC dogs, the best mums have a “family tree” and a catchy name. The best mums are patented and may cost a bit more, but they are clearly superior plants and perform better. How mums are handled by the grower and retailer directly affects quality, and also how well they adapt as perennials. Cheaper mums are typically grown so close together they don’t develop a nice rounded shape. If they are allowed to dry out even once, their roots and flower buds become stunted and will never really thrive. Get your mums early in the season before they get “root-bound”, from a grower that really takes good care of their plants. Cheap mums are no bargain. Getting mums to thrive starts with giving them enough soil. When buying mums check how much soil is in the pot; skimpy soil means poor quality, root-bound plants that will dry out quickly. 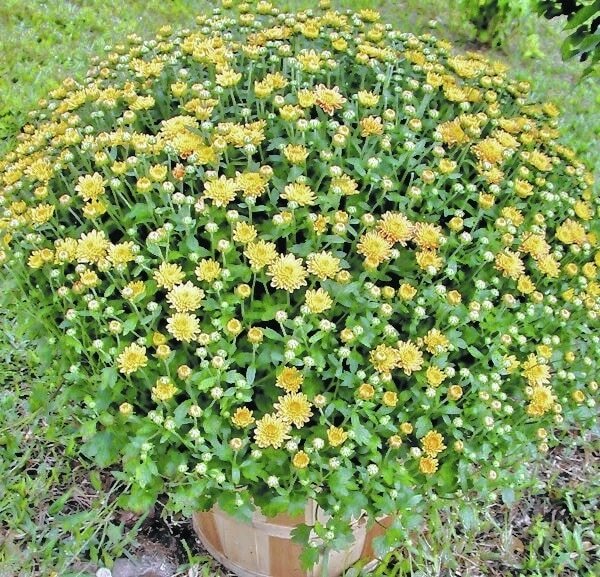 The more soil they have to grow in the bigger mums get, and the less often they’ll need watering. Even if you don’t plant them in your garden, transplanting into a larger pot right away is well worth the trouble. We sell special potting soil with “moisture crystals” that absorb lots of water and release it slowly. This is ideal for containers and window boxes. We also recommend Espoma “Flower Tone” mixed into the soil. Flower Tone is a slow-release fertilizer that won’t burn, and it’s much healthier for plants than quick-release liquid nitrogen. To plant hardy mums in your garden permanently, dig a hole at least 1 foot wide and 6 inches deep. Mix the dirt from the hole with a generous amount of compost, cow manure or peat moss, plus 1/2 cup of Flower Tone (available at our nursery). Cover with several inches of mulch and water thoroughly. Whether in a pot or in the ground, newly-planted mums need daily watering if they’re going to survive. When planting, make a shallow “bowl” with the soil to trap water around the roots. For at least two weeks you must WATER EVERY DAY, RAIN OR NO RAIN, about a half-gallon per plant. Another important step is to cut off the blooms as soon as they start to fade. You can just shear a few inches off the plant to remove the tips. This will re-direct the plants’ energy to building roots and getting established. Leave the foliage all winter to protect the roots from drying winds. When spring comes, cut the plant to the ground as soon as you see new, green leaves showing around the base. Does all this seem like a lot of trouble? If so, just enjoy your fall mums just as you would a bouquet of cut flowers. This much long-lasting color so inexpensively is a true bargain.